A rare pair of Victorian natural pearl and old mine cut diamond stud earrings circa 1880s, featuring an 8.90mm natural pearl set in a peg setting to a halo of twelve old mine cut diamonds set in silver on gold to post and disc fittings. The total dimensions of the head are 14mm by 14mm by 10mm. Total diamond weight estimated as 1.68 carats. 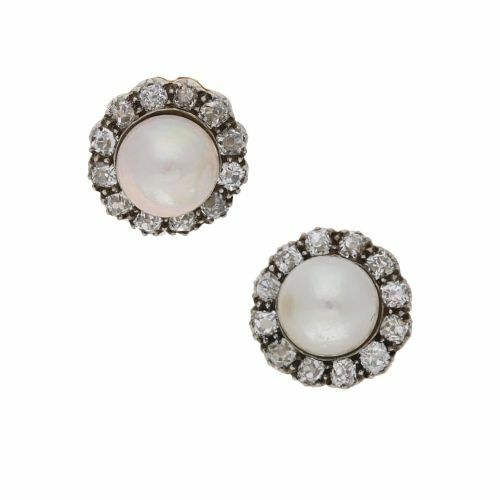 The Natural pearl mine cut diamond cluster earrings has been added to your saved items.